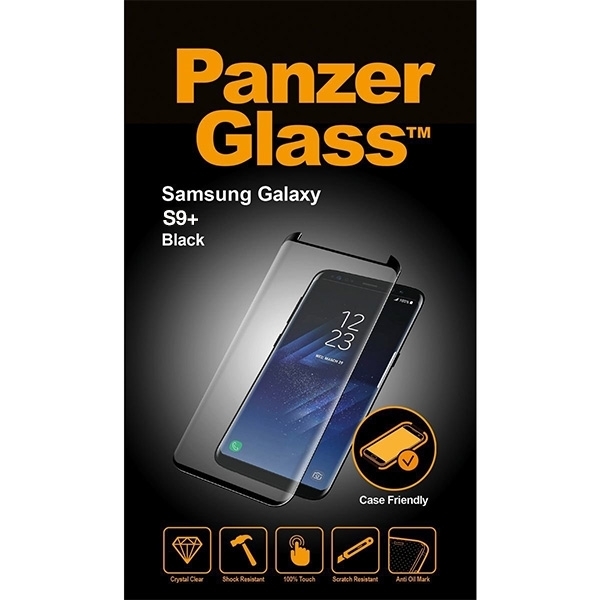 The Edge-to-Edge PanzerGlass™ screen protection made for Samsung Galaxy S9/S9+ is a screen protector made of flat tempered glass, which covers the entire front surface of the device. The glass typically features at least one precision drilled hole that matches the position of the loudspeaker of the device. Additional openings may also be used to accommodate sensors, buttons and camera elements. The shape of the protector is optimised in order to maximise protection while maintaining functionality and ease of use. All edges are carefully rounded and polished and Edge-to-Edge PanzerGlass™ is furthermore coated with a “anti-smudge” material in order to maintain and secure an excellent touch and feel from the original glass. Some PanzerGlass™ models features a coloured frame to match or enhance the original design of the device. For each specific model individual glue types are chosen to provide the most optimal solution for an easy installation and long-term durability.